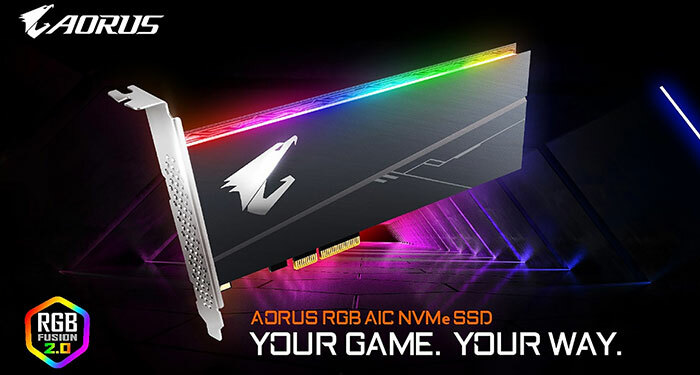 Gigabyte looks set to release its first brace of Aorus RGB AIC NVMe SSDs, as revealed during the CES 2019. Some months later Gigabyte has now got around to officially listing 512GB and 1TB versions of these add-in-cards. It is expected that availability will follow shortly. The new Gigabyte Aorus RGB AIC NVMe SSDs are based upon 3D TLC Toshiba BiCS3 NAND paired with a Phision controller, and packing a dedicated DRAM cache. These components sit on a PCI-Express 3.0 x4, NVMe 1.3 card that measures 176mm long, 71mm tall, and 13mm thick. The AIC is constructed as in the picture below; the electronic components are sandwiched between various thermal and protective layers and topped with the Aorus light diffuser which offers six lighting effects and RGB Fusion 2.0 - which syncs with compatible motherboards. Gigabyte says that the supplied and fitted double sided heatspreaders allow its SSDs to "deliver Xtreme performance at all times". Keeping the SSD component temperatures lower will help prevent any thermal throttling of the NAND chips and improve the lifespan of the memory cells, says Gigabyte. Key performance specs for the Gigabyte Aorus RGB AIC NVMe 512GB and 1TB SSD models is provided in the table below. As you can see both devices are capable of up to 3480MB/s reads, but the 1TB model is significantly faster in sequential write and IOPs tests. Gigabyte provides buyers of the Gigabyte Aorus RGB AIC NVMe SSDs with 5-year warranties, as long as they are used within their rated endurance levels of 800TBW for the 512GB model, and 1600TBW for the 1TB model. Pricing is yet to be shared by Gigabyte. RGB on: 3500Mb/s but feels like ten times more, right? ..It's like everyone forgets that the RGB features can be turned off.